Everyone likes getting something for free. 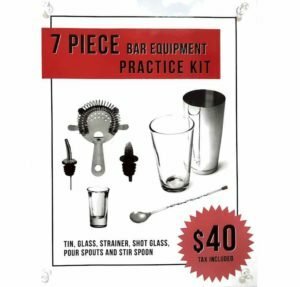 Here we are offering up a $40 bar equipment practice kit for friends you refer to our 32-hour Bartender Training program. This isn’t just one shaker set we offer up, but one for you and a second for your friend! How awesome is that? Now what is this shaker set we speak of? It is a full bar equipment practice kit that has the essential bits and pieces for you to practice your stirring and shaking skills. These are parts we source from specialty kitchen and bar equipment wholesalers, then package up for our bartending students. The equipment is exactly like what we use in the school. The same bar equipment is also what you find in bars and restaurants around Greater Vancouver. Sign Up with a Friend and Become a Bartender! We have new classes starting regularly. Come downtown and join us for 8 action packed days. Learn how to bartend in the coolest classroom setting ever. If you have any issues or forgot to add the name of your friend, just send us an email. Include your friend’s name and email address, and we will take care of it. We want to make sure you get the shaker set for your referral. If you want to be serious about becoming a bartender, you might as well get the right tools for the job. We also have these kits for sale in the school, as well as polycarbonate flair bottles available if you want to start practicing your bottle flipping in addition to cocktail making.